Giraffe, rhino and zebra – so what exactly goes in to building an African Safari? 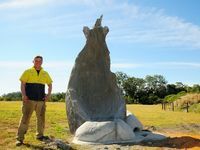 With the new arrival of baby rhino Savannah, three new zebra and the arrival of another African animal not far away, the construction team at Australia Zoo are busy building the new African Safari. 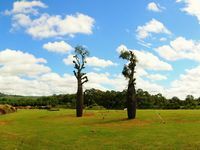 In September this year, Australia Zoo will launch stage one of the Australia Zoo African development which will cover 24 acres, taking Australia Zoo to just under 100 acres, continuing Steve’s vision to build an African Safari. Stage One of Australia Zoo’s African development plans will be an African Safari; a first for Queensland. The savannah will be an open range field where visitors can watch exotic animals such as Zebra, Giraffe and Rhino interacting from the comfort of our Safari Shuttle. 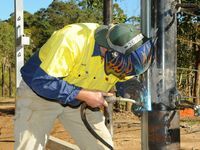 Building and Construction Manager, Mark Niven has all hands on deck for the construction of the massive 24 acre exhibit which will be the largest of the Australia Zoo exhibits. The construction team is busy laying roads, installing fencing, and building shelters for our zebra, rhino and giraffe. They havealready built state-of-the-art night yards with heating and including specialised features such as electric hay feeders for the Giraffe – it’s hard to get the hay up that high so their feeders are attached to electronic pulley systems! 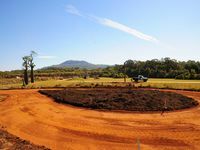 “Behind the scenes of our African Safari is a hive of activity with all things construction,'' Mr Niven said. "The construction team is currently building new rhino, zebra and giraffe shelters in the savannah which will be covered in mock rock so they have that authentic African feel. “Our in-house sculpture artist has been busy creating themed pieces for the Africa display, including a drinking hole for our rhino, zebra and giraffe which reflects the native Boabab Tree found throughout Africa” Mr Niven said. Having an open plain savannah field where African animals will roam free requires some heavy duty and flexible fencing to cater for our wide rhinos and our tall giraffe. “The detail that goes into building an African savannah that will house such a variety of animals takes a lot of planning.
" We have constructed a 4-way gate system which will allow rhinos to enter the savannah and once they are out, the gates can be reset to allow vehicles through,” he said. The countdown to Australia Zoo’s African Safari opening is on with less than seven weeks until the Queensland first exhibit opens on September 17. Owner of Australia Zoo, Terri Irwin is proud to be opening the African exhibit in Queensland. “Australia Zoo gives visitors an exclusive opportunity to experience theses beautiful African animals as we are the only home to Zebra and Giraffe in Queensland,” Terri said. Australia Zoo is supporting tourism by encouraging Queensland residents to holiday at home with a very special offer for residents to celebrate the opening of Africa. Australia Zoo is also offering Queensland residents an African adventure of a lifetime in preparation for the opening of Australia Zoo’s new African Safari exhibit, opening September 17. Queensland residents will be able to purchase tickets online and receive unlimited entry to Australia Zoo until Christmas!